Zerohedge Reports: A leading German daily fired a cartoonist over anti-semitic views on Friday after he drew a caricature of Israeli Prime Minister Benjamin Netanyahu. Suddeutsche Zeitung’s Editor-in-Chief Wolfgang Krach apologised for the caricature, however Hanitzsch refused. 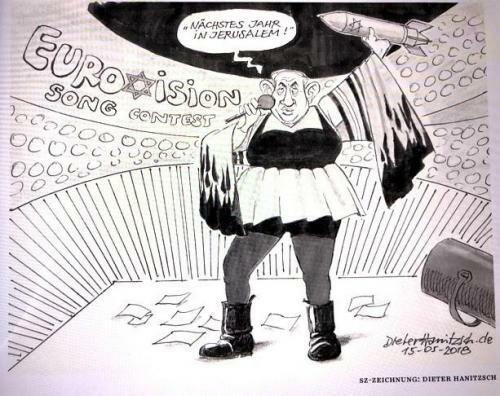 Speaking to local media outlets, the 85-year-old cartoonist said he wanted to criticise Netanyahu’s exploitation of the Eurovision contest for his own purposes and accused him of abusing the singer’s victory.